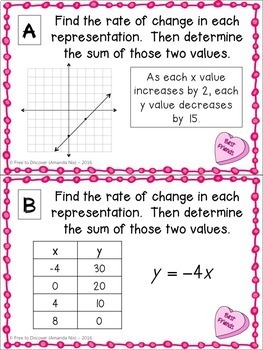 Valentine's Day activity for math class! 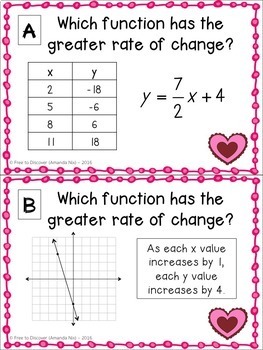 In this Valentine's Day-themed activity, students practice comparing rate of change of linear functions. Students travel in pairs to eight stations as they practice comparing rate of change represented in two different ways. Representations include graphs, tables, equations, and verbal descriptions. Students are asked to determine the greater/lesser rate of change, steeper/less steep graph, and the sum of the rate of change of two different representations. -You can either set up the 8 stations at groups of desks or tape the stations to the walls around the room. Either way keep the images that are alike together. -Pair students up. Assign one partner to be “A” and one to be “B.” They should record their assignment in the top right hand corner of their workspace. -Students travel to each station as a pair. They each complete one problem based on their letter assignment. Although they are each comparing rate of change from two different representations, they can check to see if they are correct because they should have matching final answers. -Students show their work in the stations workspace. -Once they determine the answer and confirm their result matches their partner's result, then they check the key to find that answer and write the corresponding letter in the small box in the right hand corner of the workspace. -Students continue to go to all 8 stations. You can either allow students to move freely around the room in any order or set a timer and have students all rotate at the same time. Each station should take about 2-3 minutes. -In the end, they should unscramble the letters to find the mystery word. They share this mystery word with you to confirm that their work is complete. The mystery word is FOURTEEN. I allow those students who finish first to help other students complete the activity. Happy Valentine's Day! Hope your students enjoy this Valentine's Day Math Activity as much as mine do! 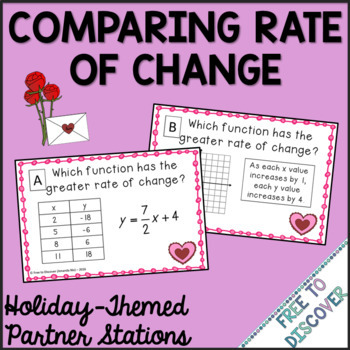 If you are looking for a mathematically meaningful way to celebrate holidays in your 8th grade & Algebra 1 math classes, check out the Holiday-Themed Partner Station Growing Bundle! Looking for a topic and/or holiday that is not currently available in the Free to Discover store? Submit your requests for partner stations using this very brief survey. ☺ Follow me to receive notifications when new products are posted. This will help you secure the 50% discount available for the first 48 hours. You will also receive occasional messages alerting you to sales, promotions, and other exciting news. ☺ Don’t quite see what you are looking for? Leave me a note in the “Ask a Question” tab. I would be happy to create a product to meet the needs of you and your students. The purchase of this product entitles a single user to reproduce the resource for classroom use only. A multiple license can be purchased if you wish to share with other teachers. The product is for educational use only. The product may not be used for commercial purposes or resold in any form. It cannot be uploaded to the Internet, including school websites.